Encounters of naval vessels with slave ships on the coast of Africa were frequent and provided exciting reading material for anti-slavery audiences. The following image shows an example of such encounters. 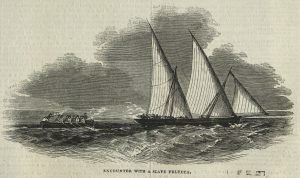 Here a boat from British man of war engages with a slave felucca, a smal slave ship on the coast of Africa. The Illustrated London News, 12 April 1845. Courtesy of University of Missouri Libraries.